The Egyptian opposition says it will boycott the upcoming parliamentary elections. This is so ripe for comparative analysis with Latin America, where similar boycotts have taken place in all kinds of contexts. At least anecdotally, my first thought is that the boycott will not have the effect the opposition wants, which is to delegitimize the regime. Instead, the most likely outcome is that the Islamists will consolidate their power and have more free rein to pass what they want. In that regard, there are a lot of similarities to Venezuela in 2005, when the opposition pulled out of legislative elections based on similar dislike of the government and distrust of how the election would be handled. The result, though, was a huge win for Hugo Chávez. I also think of the Nicaraguan opposition boycotting the 1984 presidential election. This is pretty much the definition of moving goal posts. José Cárdenas argues that Cuba is no longer supporting terrorism but that it should remain on the list of state sponsors of terrorism anyway. Oddly enough, he uses the example of North Korea to say that you must make a significant stride to get off the list. I am still puzzling over how to apply the North Korean case to Cuba. I am stealing this image from Adam Isacson's blog. 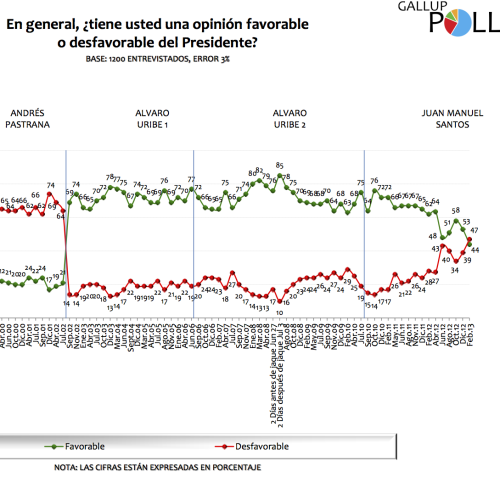 Not so nice news for Juan Manuel Santos, clearly, though at least he's not in Andrés Pastrana-land quite yet. What's so unusual in this case is that Santos' most vocal opposition is actually to his right. Alvaro Uribe has kept up a relentless negative drumbeat on Twitter, arguing that Santos is soft on Hugo Chávez and stupid about the FARC. I can't recall any former president being so vocally derisive. Declassified documents reveal Augusto Pinochet didn't want to leave power, was pissed off about the results--because sycophants told him he would win--and was rebuffed, especially by the air force. I am trying to figure out why this is considered news, when it's been more or less the accepted sequence of events for quite a long time. A key reason Pinochet could no longer cling to power was that he could not justify it to the rest of the junta, which by that time was thinking about a) international opinion and business climate; b) the end of the Latin American Cold War; and c) his megalomania. Think about your external letters. Deans may not read and digest articles, but they can do so for letters. It is worth your while early on to start thinking about who would be good--or not good--to write you a letter. Typically this means someone who admires your work without being too close to you to constitute an obvious conflict of interest. Negative letters, or too much damning with faint praise, can easily derail a borderline case. Find out early on how much input you have in choosing the letter writers and vetoing those who you think might not be appropriate. Still, many Ecuadorans have had it with promises and politics. Vladimir Peña, 33, an accountant, said he would like wholesale change but sees most of the candidates as opportunistic populists. He invalidated his ballot. "We've had lots of populists here," he said. "And what happens is they last six months, and that's it." A lot of people thought that was a distinct possibility, even probable. But over six years later, Correa won a boring election. I need to come up with a theory of boring elections. There are two takes on Hugo Chávez's return. One is that this is a sign of transition. He's been shown to be in no condition to govern and so he'll just guide the country toward early elections. The other is that he's going to tough it out and govern until he's dead. If he could claim to govern from Cuba, he certainly can do so from a Caracas hospital. I think number two is the more likely option, as the logic is more compelling. But nothing with Chávez is easy to predict. I mentioned this on Twitter yesterday, but it really needs to be broadcast as widely as possible. The president of Emory University a) thinks the 3/5 Compromise was good; and b) thinks we need to use it as an example of how to fund--or really defund--liberal arts. I've reread the thing and tried to be charitable in interpretation, but it's impossible: it is disgusting and really embarrassing for Emory University. Please read it and pass it along so it is less likely to be swept under the rug. Following up on a thread by Andrew Sullivan, Stephen Walt asks why academic writing is often bad. He comes up with several reasonable arguments--that confusing lingo sounds sophisticated, for example, or makes it easier to avoid taking clear stances that can be disproved. But I think he misses the most important reason, which is that there is no incentive to write well. There is, in fact, every incentive not to take the time required. You can publish without writing well if your ideas are good enough. Academic journal editors take their positions for a variety of reasons, none of which are related to quality of writing. They publish articles based on criteria mostly unrelated to writing per se. Review committees judge faculty members' publications generally by looking at the quality of the journal, which is unrelated to quality of writing. As chair, if I had a junior faculty member tell me they had an article manuscript ready for submission, and they chould choose between a) spending hours rewriting just to perfect the language; or b) submit it and spend those hours working on their next project, it would be irresponsible of me to recommend "a" unless I was convinced that the hours of work would actually make the article so much better that it could be submitted to a higher quality journal. It's safe to say that such a situation is extremely rare. I do want to add that there is plenty of good academic writing, and this debate tends to get overblown. But as with just about everything, if you want to see real improvement in this area you have to change the incentive structure. Stephanie Leutert has a good summary of the Colombia peace process at Americas Quarterly. Land reform continues to be a contentious area and just last month the FARC unveiled a 10-point communiqué outlining its requests. While the plan failed to explicitly mention the 4 to 5 million citizens currently displaced due to the conflict, successful peace talks could create new opportunities for these Colombians to return to their land. This is unfortunate. The displaced all too often seem to get swept under the rug. For these particular negotiations, probably part of the problem is addressing it would require some level of acknowledgment that the FARC played an important role in creating the displacement. As for land reform, it'll be tough going. I assume the negotiators have authority to hammer out details of disarmament, but land reform is a public policy issue under the purview of the Colombian legislature that will see stubborn elite opposition. Colombia desperately needs it, but can it be done in this manner? I recommend an article by J. Patrice McSherry in Social Justice about progress made in the brutal Víctor Jara murder. There is concrete evidence now: Víctor’s identity was legally confirmed and it was established that his death was a homicide. There is ballistic evidence. There have been a number of judges in the last 40 years. The interesting thing is that the new judge is not from a human rights background; he is a criminal judge. This has produced different results. The investigative work of the police has produced enormous results recently. Former conscripts are beginning to talk about what they witnessed. They had been seriously threatened over the years and they had been living in fear. The investigation has produced witnesses who saw these officers in the stadium, even though they deny it. This comes just as Pablo Neruda's body is being exhumed for an autopsy. Justice may be incomplete (Augusto Pinochet, after all, died without ever being convicted of anything) and long in coming but it can come even after many years. Manley says in his experience on Capitol Hill, Obama doesn't even have a year before lawmakers are unwilling to go along with his demands. "It's a very narrow window, not much more than six months or so for possibly everything, with the possible exception of immigration reform that could take a little longer," Manley said. Now, the six month argument may have legs. Nate Silver argues that the honeymoon will be brief for a variety of reasons. But why would immigration somehow make Obama partially immune? Any answer would mostly be ad hoc. Which types of issues have honeymoons and which don't? And precisely why? If we argue that popular issues are more likely to be passed, that's really just a truism. Tracey Eaton at Along the Malecón has an interesting blog post on the secret annex of the Commission for Assistance to a Free Cuba. That commission issued a lengthy report that essentially argued that once there was a political transition, the U.S. should take over virtually all aspects of Cuban life, down to how traffic should be (just scroll through to see many other such examples; I do this in my U.S.-Latin American Relations course). But there was more to the report that was kept secret because it was deemed sensitive. FOIA requests have brought some of it to light; nothing surprising. It seems much of it is paranoia about Venezuela and commitment to "control the policy environment." This is sensitive mostly because it provides concrete evidence of what everyone already knows to be true. There is more that has not been declassified, but my hunch is that there's nothing very juicy. Good story in the Washington Post about immigration and incentives. There is a widespread perception that immigration reform will get passed in the not-too-distant future. The details of reform are unknown, but there is widespread perception that whatever happens, there will be a) be considerably opportunity for legalization; and b) harsher penalties for being in the country illegally. Since the details are not knowable, there is a very strong incentive to cross right now if you ever thought of crossing. Just get into the country and let the details work themselves out. The longer that Congress delays passage, the more people will cross with that logic in mind. To be fair, things are relatively balanced now. Demographic equilibrium, a still weak U.S. economy, and enforcement all mean there will be no flood. But as long as reform is seen as viable but not yet happening, people will be thinking harder about crossing than they would have otherwise. Alvaro Vargas Llosa has an article in Foreign Policy that is basically nonsensical. The nonsense can be boiled down to this: if Hugo Chávez dies, then the Latin American left will wither because it won't have a leader. It presumes that a) the left in each country was created in Caracas; and b) that Chávez is actually the leader of a regional left. Both of these are patently false, and harken back to the days when grassroots movements were routinely viewed as created in Moscow through Havana. The political left has a long history in Latin America, with plenty of leaders in each country, and Vargas Llosa knows that because he railed against it for many years. It will live on no matter whether Chávez does or not. I'm quoted in this Bloomberg article about Hugo Chávez. This is just such a weird situation. Everyone is maneuvering with the idea of a potential election on their minds. With no credible source of information regarding his health, we're seeing all kinds of verbal attacks on both sides. Plenty of hubbub in the blogosphere about the utility of the job talk. For those of you outside academia, this is a key part of a job candidate's interview visit, where he/she gives a 40ish minute presentation of a research project in front of the department and interested students, followed by Q&A. My stance is that it provides a lot of information in a short amount of time to a large number of people, so remains useful. The department gets to see how well you can articulate the importance of your research, the future of your research program, how well you understand the methods you've employed, and how well you can answer questions both from people who are experts in your field but also people who have good questions from different angles. On the flip side, it is the only opportunity for the candidate to see the dynamics of a department interacting. Way back when I was first on the job market, in one interview I quickly discovered that the Q&A part was used by the two departmental factions to bicker with each other. I shed no tears when I didn't get an offer there. And I disagree with the argument that the job talk is useful primarily because faculty members are too lazy to read the portfolio. One important aspect of the interview process is to recognize that people are not paper. The job talk allows everyone to see together how well a human being articulates their research. Having everyone see it provides a good point of comparison during the discussion about who should get the offer. I was both psyched and disappointed to read this Associate Press article on how militarized the U.S. response to drug trafficking is in Latin America, which was above the fold in today's Charlotte Observer. The good side was that this story needs to reach broad audiences. Politicians assume that "doing more" by showing how much we spend on helicopters, drones, guns, etc. appeases voters. Yet for many years it has been clear that on balance this strategy is not particularly efficacious. The article accurately discusses the balloon effect and other points that too often are downplayed when officials tout how much drug production has decreased in one particular country. I am disappointed because this is old, old, old news and therefore should have become conventional wisdom a very long time ago. This ground has been covered in detail for many years in both universities and think tanks. So it is a reminder how hard it is to get empirical evidence to puncture what the government tells you. If you like reading Dirk Hayhurst, and if you're a baseball fan it's hard to imagine not liking his stuff, then go buy Wild Pitches, a just released ebook with material that he had to cut from Out of My League because of space. At $3.82 you just can't lose. My reviews of his first two books are here and here. Very funny, insightful guy. His book chronicling his injury-plagued year with the Blue Jays is slated for 2014 release. I ran the Gold Rush 5K on campus today, formerly known as the Homecoming 5K. It is still homecoming, but for some reason the name changed last year. It was in the 20s at race time, but at least sunny (some years it is both cold AND rainy, which makes for tough running). For races my wife and I split up with the kids, and I was with my eight year old daughter, who was on her bike. As it turns out, for much of the race you have to go really slow if you're with someone on a bike, because a new route has lots of bottlenecks (please go back to the previous route!). Further, despite signs and bullhorn reminders, many walkers started up toward the front. This race is getting bigger (over 700 people now) and it's great that people want to participate, but walkers in the front clog everything up. My ten year old son, meanwhile, has now run this race several times. My four year old daughter really wants to run it, but isn't up to the distance yet so goes in the jogger stroller--she gets out and runs at the end. Collectively, we are quite a sight. Charles Krauthammer argues that with a fence we can treat Mexicans like Palestinians, then give out green cards. Or not too far from that. But he and others can use whatever analogies they want if it means movement on immigration reform. Additionally, his stance is an grossly oversimplified one that at least makes it more likely reform will happen. He says a fence will solve everything, and reform can proceed once it's all built. The current Senate proposal must be improved, either in the Senate or by the House. It’s not complicated. Build the damn fence. And give “probationary legal status” to the 11 million — not on the day the bill is signed but on the day the fence is completed. Have the president drive in the golden fence post at Promontory Point II and sign the amnesty right there. Great photo op. A grinning and grotesque photo op is weird but if it makes you feel that security has magically been attained, then be my guest. This Washington Post article makes a great point. Anyone who argues that undocumented immigrants needs to go to "the back of the line" need to admit that the line can sometimes be a generation long. There are a jaw dropping 4.5 million people in line. The article has a nice interactive graphic to show how many years different categories of immigrants in different countries have to wait. It can get as long as 24 years. I've complained in the past about the "line" fallacy here, here, and here. Add millions more to a broken line and it basically ceases to exist in any meaningful way.